A team of archaeologists has found a sanctuary in central Bulgaria where the nymph cult used to be celebrated in ancient times. The sanctuary was found by archaeologists in the vicinity of the Nicopolis ad Istrum ancient site, located near the town of Veliko Tarnovo in central Bulgaria. The experts discovered an alley, leading to a spring and covered with limestone tiles decorated in a standout relief. The find is the first of its kind in the region, according to Pavlina Vladkova, leader of the archaeological team. "Until now, the only testament of the nymph cult in Nicopolis ad Istrum used to be images on coins made in the second century under the Roman Emperor Septimius Severus, as well as ancient inscriptions," she said. Vladkova expects that her team will find the remains of a cult building where the nymph worshipers stayed. Nymph worshiping, according to the archaeologists, can be traced back to Ancient Greece, where the mythical female creatures were usually part of the retinue of a god, such as Zeus, Hera and Aphrodite. 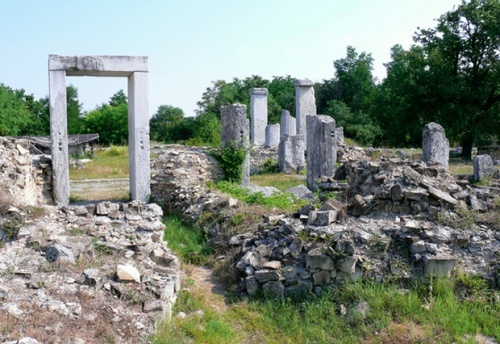 Although planned archaeological excavations are currently taking place at the nearby Nicopolis ad Istrum ancient site, the sanctuary was discovered by chance. Workers came upon the archaeological remains while installing a water pipe to the village of Resen, which called for the emergency excavations to begin, Thaindian News explained.